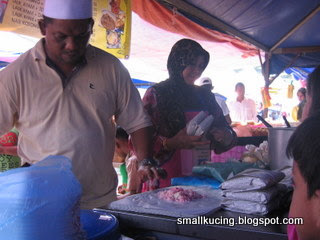 SMALL KUCING: Paung Sambal Ikan and Nasi Minyak John, Dataran Shahbandar. Paung Sambal Ikan and Nasi Minyak John, Dataran Shahbandar. Another recommendation by Yee Poh is Paung Sambal Ikan. Said very nice and crunchy. 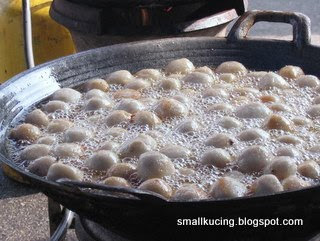 Just look at all those paung being fried in the big Kuali. Yay! So this is where Mamarazzi's favourite Nasi Minyak disappeared to. Nasi Minyak John. Mamarazzi loves the beef. Very tender and the man give quite a big portion. RM3/pkt but must be with the rice too. They don't sell the lauk only. yes...very yummy indeed....especially the Nasi Minyak John. Paung sambal ikan, sounds yummy....my tummy goes paung paung paung....hungry! 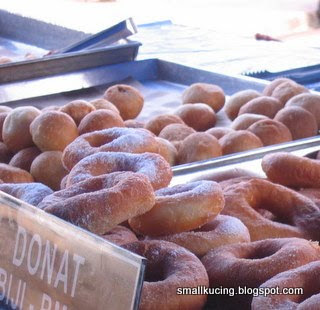 Pete- i think if you google the recipe, you can make better paung :)Talented father.